Media feel India is on the "right track" to make a comeback to the Olympic fold following "clean elections" in the Indian Olympic Association (IOA). The International Olympic Committee (IOC) suspended India last year for holding elections in defiance of the Olympic charter and appointing officials facing corruption charges related to the 2010 Commonwealth Games. The IOC also insisted India had to maintain ethics rules and bar officials charged with a criminal offence. The ban prevents athletes competing for India, which won six medals at London 2012, at future Olympics. Indian athletes are currently taking part in the Sochi Winter Games under the IOC flag. "The decks were cleared on Sunday for India's return to the Olympic fold after a 14-month suspension with Indian Olympic Association conducting its polls with N Ramachandran being elected as the president," says the First Post website. The NDTV website agrees, saying "India are seemingly on the right track that will ensure their return to the Olympic fold". The new head of the IOA seems to have made India's return to international sport his top priority. "My immediate goal is to get India back to the Olympic fold. 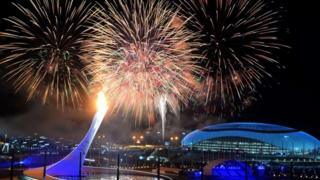 I will be the happiest person if we see the Indian flag at the Sochi closing ceremony," Mr Ramachandran said. The DNA newspaper praises various IOA factions for displaying "complete unity" and "adhering to many suggestions" in the elections overseen by three IOC observers. Staying with sports, Mr Ramachandran's brother and the Board of Control for Cricket in India chief, N Srinivasan, has been elected to head a new board that will oversee key functions of the the International Cricket Council (ICC). The new board will overhaul the sport's governance, competitions and finances. A new revenue-sharing agreement has also been reached that will give the lion's share of money to the 'Big Three' nations, reports say. The "Big Three" nations include India, Australia and England. Moving on to foreign affairs, Indian traders are preparing to display their products at a three-day event called India Show due in the Pakistani city of Lahore from 14 February, a report in The Tribune says. Despite a chill in ties, the event is meant to "promote economic and cultural links between the two countries", the paper quotes an official as saying. In other news, Sikkim in north-eastern India has become the country's first state to achieve 100% sanitation, according to a report in The Hindu. The state has surpassed its target for building toilets in homes, schools and public facilities, so that "all 610,577 inhabitants in Sikkim have latrines with high sanitation and hygiene standards", the report says. And in another step towards public health, Delhi is set to get eight "safe" street food zones where vendors will have to follow strict cleanliness standards, the Hindustan Times reports. The National Association of Street Vendors in India is training nearly 2,000 vendors in meeting hygiene guidelines, and plans to certify and monitor their outlets, the report adds. And finally, Delhi-based non-governmental organisation Manas (Human) is training the city's tuk-tuk drivers to offer a friendlier service to travellers, a report in The Hindu says. Apart from encouraging drivers to offer services such as reading material and phone charging facilities, the training includes a strong gender-sensitisation programme, the report says. "We tell them how and why they have to be tolerant to a woman dressing up in a particular way or smoking… to ensure that they have a clear understanding of their language, behaviour and attitude," the report quotes a psychologist at Manas as saying.